To celebrate the North America Outgames in Vancouver this summer, the Queer Arts Festival has chosen Games People Play as theme for their 2011 curated queer arts show in Vancouver, Canada. This group show features works by: – Abegael Jackson, Afuwa Granger, Amy Dame, Angelina Cantada, Charlotte Hewson, Dana Ayotte, Dzee Louise, Emma Kivisild (Lizard Jones), Jen Crothers, Katherine Atkins, Kimberley French, Kona Katranya, Patricia Atchison, – Adrian Fehr, Garth Amundson & Pierre Gour, Mark McGregor, Naufus Ramirez-Figuroa, Noel Silver and Oscar Sánchez. The show is curated by Persimmon Blackbridge, SD Holman and Jeff Gibson. For the past 35 years, Persimmon Blackbridge has worked as a sculptor, writer, curator and performer, as well as being a fiction editor. She is known internationally as a pioneer in feminist, queer and disability arts and culture. She is the author or co-author of six books. 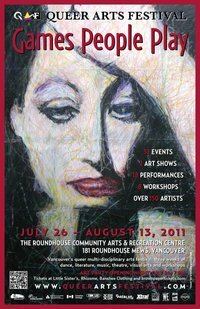 Blackbridge’s art has been shown across Canada and the U.S., as well as in Australia, Europe, and Hong Kong. She currently lives on Hornby Island in British Columbia. Raised in Los Angeles, SD Holman moved to Vancouver in 1986, becoming a professional photo-based artist, photographer and actor. A graduate of Emily Carr University of Art + Design, Holman joined the public art and activism group, the Vancouver Association for Non-Commercial Culture. Her renowed photo-based work GID, Gender Identity Disorder or… Girls in Drag, 1998 and Stealing Masculinity, 2009 are some of her many art projects.